Our Susan Lanci Dog Harness collection is sure to impress. Take your dog to the top of the fashion world with a designer dog harness from Doggy In Wonderland. These Susan Lanci Harnesses are made of genuine commercial upholstery grade Ultrasuede® fabric imported from Japan with Swarovski crystal accents. This soft, comfortable fabric is breathable, washable and colorfast. They are super cute for your precious pup and comfy too! 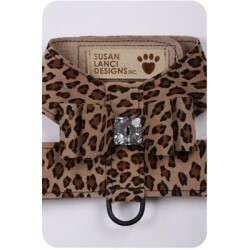 Susan Lanci dog harnesses are also made with a strong velcro with a hold that lasts. These dog harnesses are made in the USA! We do have four designs in stock that will ship right away! They are the Black Big Bow Harness, the Cheetah Big Bow Harness, the Tiffi Blue Giltmore Crystal Harness, and the Zebra Giltmore Crystal Harness. Put a Big Bow on your bundle of joy! Our Big Bow embellishment is accented with a large, dazzling S..
For those dog owners that are looking for that special sparkle and glitz for their pup, this is the .. Put a Big Bow on your bundle of joy! Our Big Bow embellishment is accented with a large, dazzling Sw.. Flowers are three dimensional and all handmade, centered with a large Swarovski crystal. Like all o.. Flowers are three dimensional and all handmade, centered with a large Swarovski crystal. Like all of..